That's a phrase I coined to describe the month of July here at Mile 14. We're up at 3:45 every morning. MP opens the launch and parks cars, I'm in the boat at 4:15 for an hours prep work and then we shove off at 5:45 for a days fishing. MP is a machine, we both know that the month of July is showtime....bare down...do it and do it well...do it hard. We do 75% of it all in July so it has to go smooth. With 5 days left its now apparent that we're going to 'make our season' and the silver fishing will deliver a slower pace to our lives. I would never ask MP to cook this time of year so its fast food and Pizza, last night it was take out Chinese. My garage smells like the YMCA locker room from all the drying clothes and rain gear. Some how or another I got salmon egg cure on the toilet, mosquito repellent is everywhere and we've had a black bear turning over the dumpster. WE LOVE IT ALL. The picture below is a list of goals I compile on the chalk board every year to help keep me focused and motivated. Its in my gear shed next to the river and I see it daily as I load and unload, even the shed smells a little funny now that I think of it. Fishing this week was steady, we held our own and batted a good 500 for the week. some of the fish were absolutely gorgeous like this one that Tom Brugeman caught yesterday. This fish was interesting as I was experimenting with hooks because we'd been missing some bites. 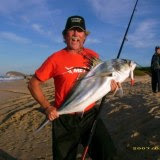 I had Tom rigged with a big wing cheater and an 8/0 hook, usually a 6/0 is what we do. This fish swallowed the hook so deep that it couldn't be retrieved without major surgery so when Tom took the fish he got the hook as well. For me theres nothing better than guiding kids and older folks onto fish. Its really what my job is all about, peoples safety and availing them to the wonders of the Kenai River . 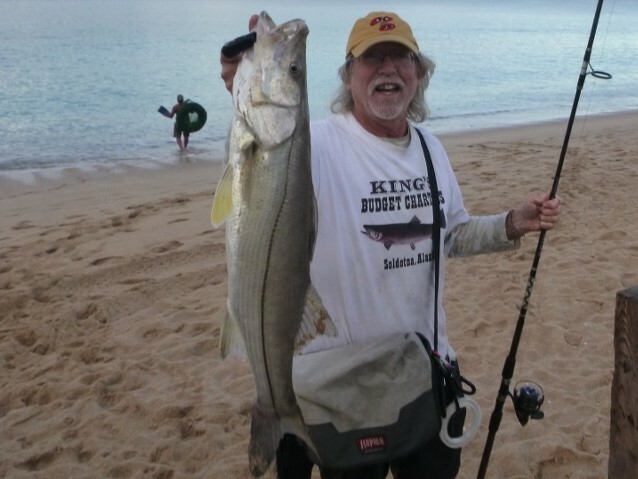 So naturally I was just tickled when Kobe who is Nikki's 78 year old dad caught this beautiful King. This fish flat fought, we moved several boats, it jumped, it swirled, it ran and now he's on his way to a barbecue. Wow. The guys are pretty good at catching those big ole salmon but it takes a women's touch to catch and appreciate a fine salmon like this one. 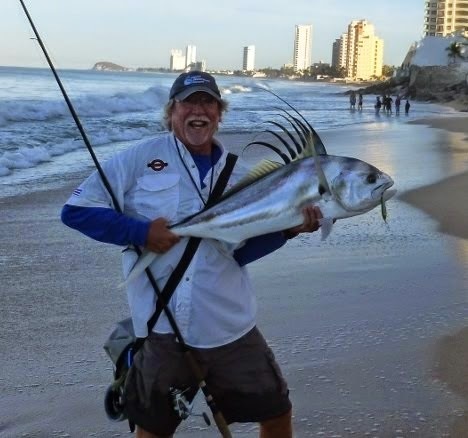 Pam caught this Jack...or in this case a Jill on a K-16 Kwikfish that was almost the same size as it. Now that's an ambitious fish. She is a cousin of Cindy Keyes who told her that fish like that are just like veal, soft and tender and oh sooooo flavorful. And please never mind that they took this pic right in front of one of my signs, they really are trying to help me promote business. After all, we're all about honesty. The last pic is the view from guide boat #003 as we back bounce the tide. Its a floating social club, everybody knows each other and are bonded by the simpleness of fishing and having fun. In the foreground are my old friends Mac and Carol Padgett. In the always together department they are worse than me and MP. This day we chatted a bit about boating safety as Carol had fallen out of the boat. It scared them into wearing a life jackets. I know the boats look real close together and they are but with the right attitude its really part of the fun. Its like choreography, we hook a fish and fall out of line as the other boats give way and then fill in our spot. 20 minutes later we do the same for the next boats turn to catch...its the Kenai. Two really big things happened at Mile 14 this week. The reds (sockeyes) arrived in force and I turned 57, but my right knee tells me its 77. We held our own on the King salmon front and I made new friends with Bill and Linda Worsham who are from Texas and personal friends of my musical hero Kevin Fowler. They tell me that Kevin is as nice and approa chable as I could tell from his music that he would be. Pretty cool, I'm feeling connected. 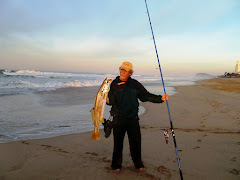 We had a great day, they fished with the Kruncos's and Mike caught this nice King. But the narliest and most exciting fish of the week was this beauty caught by our friend Elaine Woodburn. She stuck this guy like a seasoned pro back bouncing the tide and it jumped and ran and well....it was just one difficult fish and took 20 minutes to land. Elaine was born and raised here in Soldotna, her family (the Davis's) were some of the people that made me feel welcome when I arrived in the 70's. So it was pretty cool to be able to help her to catch her first King ever but also go sportfishing on the Kenai river for her FIRST time ever. As you can see Elaine was awful darn happy with that King Salmon...a new Kenai convert. Elaine works out in the gym with MP and I so I know she's looking forward to that wonderful salmon protein. When my friend Tony Knowles was Governor he had the philosophy that the most important salmon was the one that Alaskans eat. So the Kenai River Personal Use Dipnet fishery was started and oh baby is it popular. This Pic was taken from the bluff in old town just today. Kind of reminds me of the pictures I've seen of the Woodstock Rock Festival....kind of the same look, rainy and tents but with a whole lot more dead salmon. In the background you can see the old Columbia Ward Cannery where I had my first regular pay check job. On this same day in 1972 I was loading carts full of cans of these same salmon into the retorts to cook at high pressure for 45 minutes. Then we rolled the loaded carts into a lye wash to clean and cool . I remember the 'popping' sound that was a bit like reggae music as the cans cooled and began seal. Oh, I made $2.65 an hour. And red fever is alive and well here at Mile 14 as well. Why not, what a deal to have this wonderful source of number 1 grade Red Salmon so plentiful. Our parking lot is crammed with cars and the fisherman are easily catching their limit of 3. To put in perspective, the fish enter the river at a rate of 50,000 a day. Its dangerous being a salmon, I think I'd take the road. The next pic is our local Red guru here at Mile 14. Mark Johnson lines these fish better than anybody I've ever seen. He's a natural born killer and because I don't have time to either dipnet or sportfish for them Mark helps collect some for us. the next series of pics is the scene at our gutting table. Alaskan's love their fish and this shows in how its taken care of, winters coming as we say.... I'd like to be able to tell you all about it but the best I can do is describe it from the rivers view. The old rivers full, done up, full of people, full of fish. Full of fun, full of greed. Full of wonder, full of rumors, full of profit, lots of laughing...its one unique place, that's all I know. It was how long ago??? Also this last week I had the privilege to guide and old friends father. Lori Landstrom was a Park Ranger here years ago and she picked me to take her 85 year old dad Larry fishing. We had a great time and Larry caught a salmon but I think maybe 8 hours in the boat was a bit long. I hope they were as tickled as I was proud to be able to guide them. Its really what this whole thing I do is about, to safely and comfortably share the outdoor experience. Last week I reported on the mad mower, my wife. Now I kind of figure maybe a few of you thought I was exaggerating (as I'm prone to do) when I said she mows the road. Well, today I caught her and here's the proof. She says that if the blade wasn't so dull it probably wouldn't sound so bad. Yikes. The best person I know loves her garden and yard. Rain or shine, sleet or snow its kept looking like the Anchorage Botanical garden. She loves to run the mower, I think its the therapy that comes from being able to change something so fast and entirely that she loves but she'll say its the exercise and love it all. Through the years she's mowed the top off our septic clean-out enough times to get it down to the level it should have been installed at to begin with. She's mowed the forrest, she's mowed the driveway and she's even mowed the boat launch. So let me tell you that if you have an avid mower in the family invest in the Honda Mower, those $100.00 Home Depot specials last a year around here. Today was the first sunny day in a week so I got to look around as MP was gardening and I had to admit she has the place looking great. I wish I could take some credit but thats impossible, I don't do any of it...none. But I do have an eye for it, this fern jumped out at me, it looks like something you'd see on the island at Jurasic Park. The next pic is our vegetable garden with the required moose fence around it. We usually get some carrots and radishes and maybe a little cauliflower. MP has invented her own potato technique that I call 'towering spuds'. She grows them in a 5 gallon bucket and when the leaves get to the top she adds another bucket and continues to add dirt as they grow. Last year she went 3 buckets high and when its time to harvest you just dump the buckets....walla, patent pending. In our greenhouse we have the usual tomatoes and cukes but every year MP has to try something exoctica. this year its tomatilla's and this cute little pumpkin thats got to go a ways to beat the 750 pound Alaska record. One thing we always have plenty of is cucumbers, if the rest of our lives were as successful as MP's cuke crop we (mmmm...she, I mean) could do secrets to life seminars and make a jillion. Cukes are one of those things that you can only do so much with. My favorite is a tart cuke salad made with sour cream, vinegar, shallots, a little dry mustard and a generous amount of the secret ingredient, dill. A few years ago I found a recipe for cold cucumber soup on epicurious.com. I went to the store and bought the heavy cream and all the ingredients...it stunk. So now we just eat them fresh sliced up on a plate with tomato, sweet onion and an avocado with a little olive oil drizzled on top and maybe a little Maytag brand Blue cheese. mmmmm. Now the next pic is of our cherry tree that I did have something to do with. I had to go to Anchorage last spring to renew my coast guard license and while at Cosctco I spotted all the trees. I was focusing on a blueberry tree because I lik e blueberries of course when a guy gave me unsolicited advice. He said that if you want to impress your wife with something that will actually grow in the frozen north get this Cherry tree. So he picked one out for me. He was spot on, one year later its growing like a weed and has two cherries on it. Magic. Thank you all for reading my blog, as I head towards 8000 reads I hope its made you smile as much as it has me. I know I promised to keep it positive so let me stray from that just a bit while I explain about my pictures. I had a great Canon Powershot camera that surprised and stunned me with the quality of pics I took. It died on the way back from Mexico and I replaced it with a Sony dsc-s2100...don't buy that camera. The current Consumer Guide has it rated dead last. I guess I should have read the reviews instead of being taken in by the cool orange color. I'll replace it with another Canon soon but in the meantime we'll all just have to imagine how pretty this or that really could be........Let your mind roam free.